Your powder room is likely one of the most high-trafficked areas of your home, especially when you consider traffic per square footage. However, despite the fact that so many people are in and out of the powder room constantly, many homeowners don’t give it the attention it deserves. The fact is, although it’s small, this tiny bathroom shouldn’t be neglected. Before you begin sprucing up the powder room with some of the following tips, it’s crucial that you do a thorough working-order check. Just because the toilet flushes and the water runs doesn’t mean there isn’t anything you can do to improve its usability, or prevent future issues from happening. According to Fix It Right Plumbing, https://www.fixitrightplumbing.com.au/plumber-blairgowrie/, a plumbing company in Blairgowrie, preventative care is one of the best ways to avoid a potentially disastrous and costly issue later down the line. Once you’ve made sure that there are no hidden leaks or water pressure issues lurking around the corner, it’s time to focus on the fun stuff: styling. The following are seven greats ways to jazz up your powder room. And when you’re done, check out this list of powder room ideas. One of the biggest benefits of working with a powder room is that you have ample opportunity to be creative. Because it lacks a shower and bath, you won’t have to deal with the humidity affecting the wallpaper. And fortunately, there are thousands of different wallpaper types, from bold single colors to intricate patterns and geometric shapes. Tiny luxuries in a tiny space are great for giving your powder room that sophisticated 5-star hotel room look and feel. And your visitors will especially enjoy it, too. Instead of using cheap plastic soap dispensers that have to be replaced time and time again, why not use a fancy soap dispenser that matches your bathroom aesthetic? And instead of a cheap towel rack, why not premium hand clothes or plush hand towels that feel like pillows as you dry your palms? There are plenty of ways add some bathroom luxuries. Without having to worry about cabinet space, you’re free to be completely creative with the type of mirror you have in your powder room. You can choose a larger-than-life mirror that becomes the superstar of the space, or you can go for a muted antique look. Check out this Pinterest list of bathroom mirror inspiration to help you look for unique mirror options. Smell is one of the most powerful senses, and when it comes to the bathroom, smell deserves some extra attention. From a scientific standpoint, the sense of smell is closely linked with memory, and even though this fact is observed on a much higher scale, your bathroom can play a role. Floral smells, for example, tend to conjure up pleasant thoughts. A lavender-scented candle can make your guest feel welcome in your bathroom; an experience they’ll associate with your home time after time. A cinnamon smell, on the other hand, can even improve your ability to remember certain tasks. Candles, automatic scent sprayers, and perfumes are just a few ways to give your bathroom a unique smell. Incorporating plants into your home isn’t just about decoration: psychologists and scientists have found that nature is directly linked to creativity and happiness, and can even create “restorative environments” within your space. By bringing in some inspiration from the outdoors, you can create a peaceful mini oasis in your powder room. For powder rooms with no windows, don’t fret: there are many plants that thrive in low lit areas, too: these include the lucky bamboo, Golden Pothos, and ZZ plant. Alternatively, you can set up hanging terrariums, which are much like tiny little plant worlds that are captivating on their own. 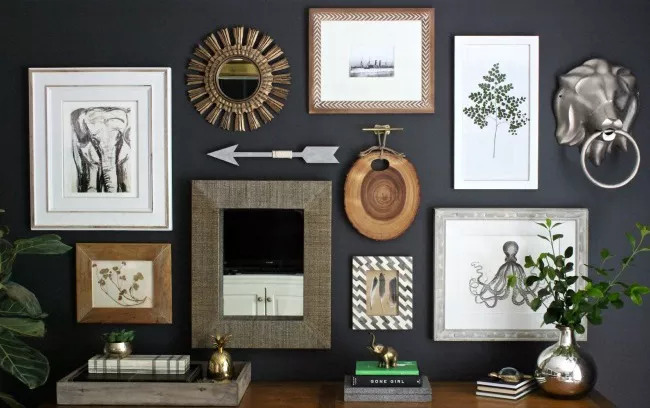 And lastly, some well-curated flowers that perfectly complement your gallery wall and wallpaper can easily be the icing on the cake of a great powder room. The sink and toilet are the focal points of the bathroom, and it doesn’t take too much money to dress it up. For example, there are hundreds of variations of vessel sinks, which can add a touch of class to the area. Different types of fancy faucets can be modern, retro, antique, and everything in between.